GroundSmart™ Playground Rubber Mulch is uniquely designed and manufactured to not only meet, but exceed today’s playground safety standards and guidelines. GroundSmart™ Landscape Rubber Mulch looks better all year, it’s more durable, cost-effective, maintenance free, and eco-friendly than other landscape ground cover materials. GroundSmart™ offers 2 Bulk Bag and 1 98 bag pallet buying options. Either are ideal for creating a beautiful and safe ground surface for your home or business. GroundSmart™ Playground Rubber Mulch helps improve playground and play area safety for children of all ages, cuts down on maintenance costs, and comes in 5 colors to match your playground design. GroundSmart™ Landscape Rubber Mulch is more durable, cost-effective, maintenance free, and eco-friendly than wood mulch, stone and other landscape groundcover materials. When it’s time to train, GroundSmart™ Training Course Rubber Mulch is the training surface you can count on and one that’s as tough as the people training on it and easy to maintain. As part of North America’s largest tire recycling company, GroundSmart™ is the industry’s leading brand of rubber mulch products into the residential, commercial, and military markets. 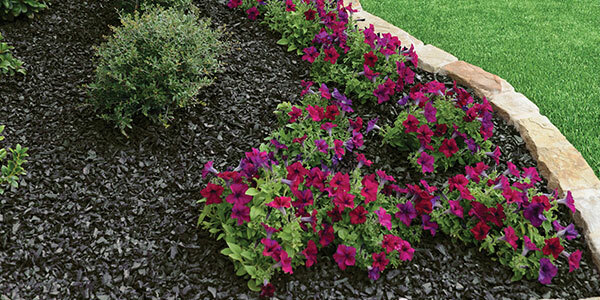 GroundSmart™ Rubber Mulch offers five beautiful colors that can match any project design you have. Color is guaranteed to last for twelve years without fading or staining. Not sure how much Rubber Mulch you need for your project? Use our handy Coverage Calculator to find out! GroundSmart™ products, including Rubber Mulch, help keep millions of scrap tires and billions of pounds of scrap tire rubber out of landfills every year. GroundSmart™ is dedicated to turning recycled tire rubber into new, innovative, eco-friendly, sustainable, products that improve the environment and people’s lives. Through our nationwide network of processing plants and convenient shipping locations, GroundSmart™ is dedicated to providing the industry’s highest quality rubber mulch, rubber infill and rubber topdressing products. Whether you’re looking to create a safer playground, a smarter landscape or improve the performance of a sports surface, GroundSmart™ is the smart, sustainable, economical solution.